From Habitability to Life on Mars explores the current state of knowledge and questions on the past habitability of Mars and the role that rapid environmental changes may have played in the ability of prebiotic chemistry to transition to life. It investigates the role that such changes may have played in the preservation of biosignatures in the geological record and what this means for exploration strategies. Throughout the book, the authors show how the investigation of terrestrial analogs to early Martian habitats under various climates and environmental extremes provide critical clues to understand where, what and how to search for biosignatures on Mars. The authors present an introduction to the newest developments and state-of-the-art remote and in situ detection strategies and technologies that are being currently developed to support the upcoming ExoMars and Mars 2020 missions. They show how the current orbital and ground exploration is guiding the selection for future landing sites. 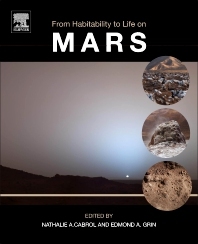 Finally, the book concludes by discussing the critical question of the implications and ethics of finding life on Mars. 2. An Origin of Life on Mars? 4. Are Recurring Slope Linae (RSL) Habitable? Cabrol is the Principal Investigator of the SETI Institute team that was selected by the NASA Astrobiology Institute in October 2014 to lead a 5-year project entitled: Changing Planetary Environments and the Fingerprints of Life. See: https://astrobiology.nasa.gov/nai/teams/can-7/seti/ The project is about the search for habitability and life on Mars leading to the Mars 2020 mission. Additionally, as of August 7th 2015, Cabrol became the Director of the Carl Sagan Center at the SETI Institute, leading the science for multidisciplinary research scientists who search for life beyond Earth from prebiotic chemistry, to the exploration of the Solar System, the exoplanets, and the search for technologically advanced extraterrestrial civilizations. Grin has an academic background in hydrogeology, and for 30 years worked on dam and hydropower projects. His familiarity with the characteristics of lakes and rivers on Earth makes him especially valuable when it comes to looking for similar features on Mars, where NASA’s exploration strategy has been to “follow the water.” Grin, together with his wife, Cabrol, championed Gusev crater – an apparent lake basin – as the landing site for the Spirit rover. A new three-year project in which Grin is involved, called “Life in the Atacama”, will demonstrate that autonomous robot rovers can reliably detect primitive microorganisms. The rovers will be field tested in Chile’s Atacama desert, an earthly analog for the landscapes of Mars.